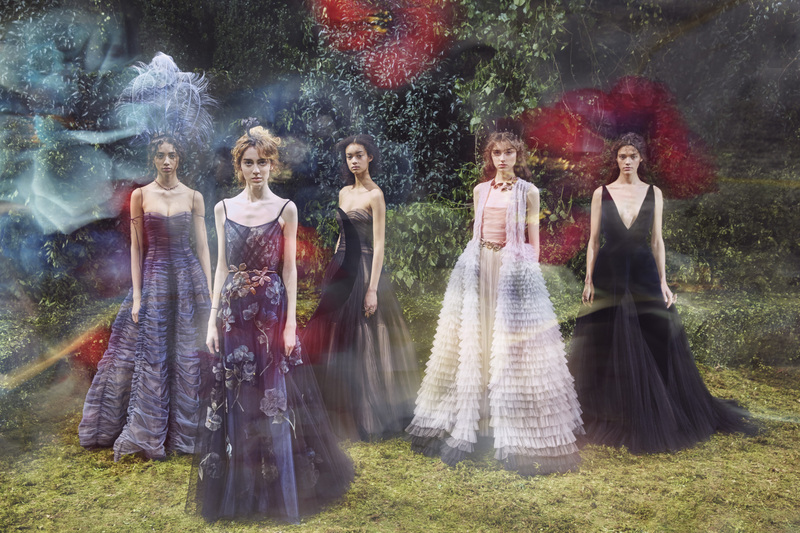 Last night at the Musée Rodin, Maria Grazia Chiuri unveiled her first couture collection for the house of Dior. Her fascination for mysterious labyrinths and secret gardens were beautifully explored through tulle dresses that trapped delicate flowers and butterflies. Chiuri’s version of spring was every bit ethereal, a far cry from Raf Simon’s couture collection in 2015. His thigh-high vinyl boots and brightly coloured body suits were cleverly replaced by gorgeous headgears, organza and tulle dresses in powdery hues of mauve, blue, pink and grey. While the ball gowns were Chiuri’s winning contribution to spring summer 2017, it is hard not to love the reimagined classics. We’re talking about the tuxedo that was given a contemporary feminine twist, the iconic bar jacket styled as a cape, roomy culottes with satin embellishments and the domino coat with a black velvet hood. Even though we hoped to see more of those popular pro-feminist slogan t-shirts from Chiuri’s last collection, this one stood out as a stunning intersection of fashion and fantasy.